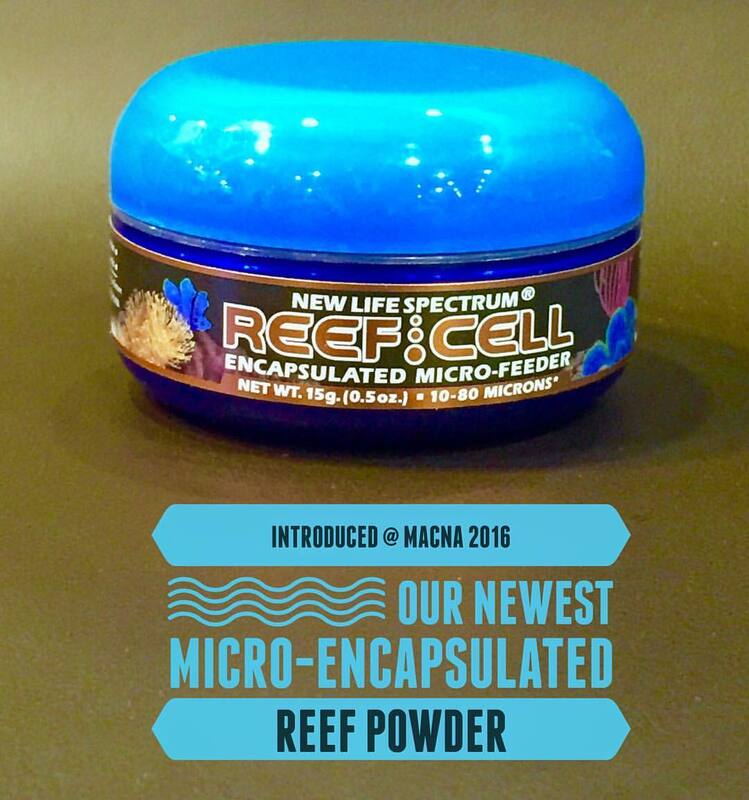 San Diego, California — Sept 9th, 2016—New Life International, creator of New Life Spectrum® aquarium foods, introduced an updated version of its micro-encapsulated reef powder food at the 2016 Marine Aquarium Conference of North America (MACNA) in San Diego, California. Reef/Cell is designed for SPS stony corals and filter-feeding invertebrates, with food particle sizes from 10 to 80 microns, with 80% of particles 50 microns or less. This is equivalent to the size of most phytoplankton and zooplankton. The micro-encapsulation process creates a non-polluting, water-stable particle that tends to be neutrally-buoyant in salt water and stays in an aquarium water-column for an extended time. Micro-encapsulation is a process developed in the pharmaceutical industry in which micro-particles of nutrient are embedded in a matrix of water-stable binder such as alginate. “The micro-encapsulation process is really exciting and makes possible foods that aren’t doable any other way,” said Ian Tepoot, President of New Life International (makers of Spectrum®). New Life Products benefit from their Spectrum Nutrition Formula that is the basis for their high-nutrient foods. Reef-Cell is an updated product replacing the original product formerly known as Nutri/Cell. Reef-Cell also now comes in a smaller 15-gram package, which is suitable for home coral reef aquarium enthusiasts and nano-tank owners. The particulate food is recommended at 1cc of powder per 30 gallons as a starter amount, with the quantity adjusted based on the hobbyist’s observation. Thus, a small package is preferable for many consumers. A 40g package is also available. For more information visit www.nlsfishfood.com or check out New Life Spectrum on Facebook.